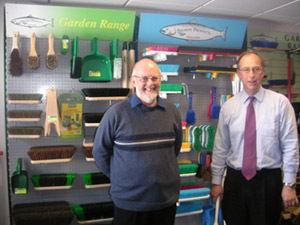 The Hill Brush Company Ltd is a family owned business started in 1922 by Fred and Bill Coward. They were subsequently joined by their respective sons David and Richard, and today David's sons Philip and Martin run the company whilst Richard's son Peter runs our subsidiary company in the U.S.A. The company has come a long way since the early days of all hand-made brushes and now has some of the most advanced brush-making machinery available. We employ approximately 115 people, manufacture over 3 million brushes per annum and sell to over 1,000 customers in over forty countries world-wide under the "Salmon Products" logo. Throughout its lifetime, the main objective of the Hill Brush Company Ltd has been to provide its customers with very high quality brushes at reasonable prices. This could not be achieved without the hard work and conscientiousness of our workforce, some of whom are the third generation of their families to be employed by the company. Their U.S.A. subsidiary Hill Brush Inc. is located in Maryland, Baltimore, is a 100% owned subsidiary and incorporates Champion Brush Inc, which was purchased in early 2001. Our company installed the Profitmaster system in late 2005, mainly to give the company a real-time stock control and warehouse management system, neither of which were available from our previous rather outdated package. As with any new system, the staff had to become familiar with the different routines, but this was achieved quickly by taking advantage of the excellent onsite training offered by Profitmaster. We have also received good support from Profitmaster when any problems have occurred. We are now considering extending the Profitmaster system by purchasing their website, which will enable web sales to be automatically integrated with the rest of our software system. A major plus point is that our customers can access to up-to-date stock information and order progress details. They can also check their account, and print off copy invoices themselves, which will save us a lot of time from answering such queries.